Our SERVPRO Storm Property Restoration Team has the experience and resources to handle your New Jersey weather related water property damage. It’s critical to take quick action following a flood or storm water intrusion to your local New Jersey home or business. Call our New Jersey Storm Damage Cleanup, Restoration and Repair team. If it’s a roof leak, exterior damage, a cracked foundation or basement flooding, causing your water property damage, call our Disaster Restoration Specialists at SERVPRO of East Windsor to begin taking steps to stop the water damage from becoming an even bigger disaster. Our professionals first assess the severity of the situation and determine the full extent of the storm, flooding or additional water damage. Restoring your home or business quickly, takes specialized equipment and highly skilled IICRC professionals. Our team closely inspects the flooded or other water damaged areas; measuring the moisture content, humidity and temperature to assess the full extent of the damage. They provide a step-by-step solutions to restore and repair your local New Jersey property and contents to help minimize additional damages, we provide services to Trenton, Monroe, Millstone, Princeton, East or West Windsor. 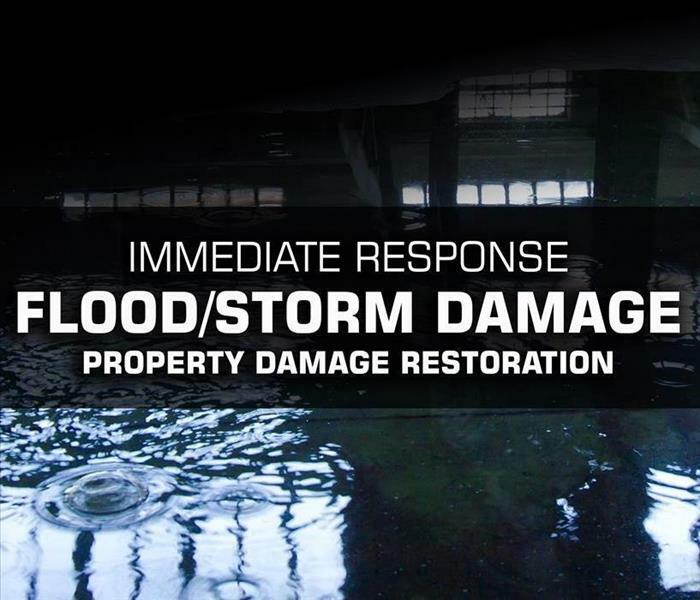 Our SERVPRO of East Windsor Storm Property Restoration Team has the experience and resources to handle your weather related water property damage quickly and professionally. We know what comes next after your property suffers a disaster storm water damage and we are prepared 24-7 with Emergency help to repair your home or business when you need us! Call our New Jersey Storm Damage Cleanup, Restoration and Repair team. Spring is here, now is the best time to check for water property damage caused by Winter. Winter weather can be hard on your residential or commercial property be sure to look for water property damage left from frigid winter temperatures. Here are some tips for where to inspect your home or business for potential winter property damage disasters. Even after a very milder winter, it is critical to assess your property’s exterior to make sure the cold weather hasn’t left you with property damage. It’s also important to react quickly and take the necessary steps to prevent property damage from compounding, spring showers are on the horizon. 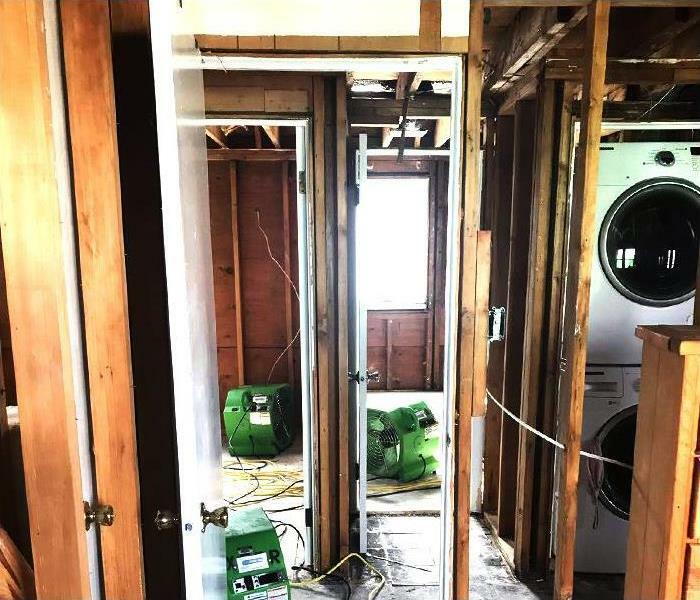 SERVPRO of East Windsor responded to a local Princeton, NJ property that suffered a water damage disaster indoors due to winter weather and water intrusion. A roof leak went undetected for some time, causing significant water intrusion and secondary damages from the top down. Our professional SERVPRO service technicians were onsite quickly to treat the water and mold damage to the roof, walls and floors. The drying process was started by placing large commercial drying equipment in the area. Once the area is dry, the restoration and rebuilding process could begin. Winter weather can be hard on your New Jersey residential and commercial property be sure to look for problems that frigid temperatures, snow and ice may have caused. Winter weather can cause upwards of three and a half billion dollars of property damage in the U.S.
Winter storms are accompanied by lots of moisture – snow, freezing rain, ice, hail and wind – come together to create common issues like ice dams, frozen pipes and frost heave that may cause damage to your home or business. SERVPRO of East Windsor is always ready to respond to your Trenton, Millstone, Monroe or Princeton property damage restoration needs quickly, and we can begin the restoration process immediately. Our local disaster restoration services include an inspection and assessment of the damaged areas, water removal/water extraction, drying and dehumidification, cleaning and repairs, restoration and building as necessary. There are several common problem areas to inspect during spring for potential damage, including your roof and gutter system, foundation and yard, plumbing system and your property’s exterior. From the top down these areas could see potential damage from the worst that the winter elements can bring. The function of your roof and gutter system is to remove excess water from your property to prevent damage. High winds, hail and winter storms can tear off or destroy shingles and ice can obstruct the flow of water in gutters and downspouts, allowing water to breach the structure. Winter forces can cause obvious holes in your roof from wind or branches, but additionally less noticeable damage from hail or other debris can cause indentations and divots that overtime can lead to ice and moisture damage. Heavy buildup of ice on your roof can cause your gutters and downspouts to separate from your roofline, disrupting the flow of water and cause water intrusion and damage to the inside of your home or business. It’s a good idea each spring to inspect your roof, gutters and downspouts for visible damage, debris and that they are functioning properly. Cold temperatures, snow and hail can take a toll on the structure of your property including the windows, doors and exterior of your home or business. Without proper repair, peeling paint, cracks in sealant and other damage could lead to moisture infiltration and a water damage disaster. After winter passes, damaged paint should be removed, primed, sealed and repainted. Cracks and air leaks should be sealed and repaired to prevent more devastating damage later, and missing siding should be replaced before springtime showers arrive to prevent additional water and structural damages. Another potential casualty of winter weather is your foundation and yard. Hairline cracks in the concrete of a foundation that develop naturally over time can expand, causing major structural damage over time if not properly taken care of quickly. Water can find its way into cracks, freeze and make them larger during the frigid cold months of winter. Getting your foundation repaired in the spring can help prevent more problems from developing as time goes by. The best way to avoid foundation damage is to keep moisture moving away from your foundation. Each spring check your gutters and downspouts for debris or clogs, make sure they are functioning properly, and that they drain at least 10 feet away from your home. Make sure the ground around your home is graded away from your foundation and consider adding a rain garden to your property to combat a bigger problem. Another vulnerable system in your New Jersey home or business that could be damaged from cold winter temperatures is your plumbing. To adequately deliver water to and from your sinks, boiler, and spickets your plumbing system keeps the water forever flowing. However, during cold winter days and nights cracks and stresses can occur and eventually lead to leaks and pipe breaks that can have a damaging effect on your local commercial or residential property. Remember to survey your pipes regularly for cracks and leaks, paying closest attention to the pipes that are closest to the elements or in poorly insulated areas such as the basement or crawlspace, or outside walls and attics. Take this opportunity to add some additional insulation as a precautionary measure for the future winter weather to come. Mold is a GROWING ISSUE for Middlesex & Monmouth County home and business owners in New Jersey DURING WINTER. Mold needs moisture, warmth and food to grow, so why is it becoming such a problem for property owners during cold winters. Mold needs moisture, warmth and food to grow, so why is it becoming such a problem for property owners during cold winters. Proper insulation is important to save on energy costs and keep you warm and cozy during winter temperatures, but without proper airflow and ventilation you could be creating a WINTER MOLD DISASTER. Proper air circulation is crucial to avoid water and mold damage to your Monroe, Windsor, Princeton or Trenton residential or commercial property, especially during winter. Airflow and ventilation regulate temperature, removes impurities, prevents mold and creates a more healthy and safe breathing environment. While mold is generally thought to thrive during the warmer months, mold growth in the winter is now becoming a more common problem for home and business owners. Mold needs moisture, warmth and food to grow, during winter turning up the heat in your well-insulated and tightly sealed home or business may feel like the best way to shield yourself from the cold, but without proper ventilation that warm moist air can’t escape, especially in high-humidity areas such as the bathroom, kitchen, basement or attic it forms condensation on your windows, walls and other areas of your property that can cause water damage and mold. Most New Jersey homes and businesses have numerous trouble spots for mold and moisture, in residential properties the places that get most easily affected by mold are bathrooms, kitchens, basements, attics, garages, and laundry rooms. In commercial or municipal buildings; bathrooms and kitchens, cafeterias, gyms with showering or pool areas, HVAC systems, and any area that has high moisture content will be an ideal breeding ground for mold. Several factors lead to increased concerns about mold during the winter months. For one thing, moisture conditions indoors can lead to the growth of mold and mildew; certain areas of the home may experience intensified levels of humidity because of a lack of ventilation. Bathrooms and kitchens are particularly susceptible to this problem; the accumulation of steam from showers, washing dishes and cooking in the kitchen all add moisture mixing with heated air. Moisture that travels through the air from your basement, bathrooms, or kitchen may condense when it meets a cold wall. Because of cold weather, windows aren't usually open, and condensation collects on indoor surfaces such as cold walls or windows and their frames, often creating ideal conditions for mold growth. Less than optimal insulation, mold can also growing during the winter on the inside walls, especially on the surfaces closest to the outside of your home or business. Controlling moisture is the key to controlling mold. Generally, this is done in one of two ways. First, effectively dry and fix any leaks, spills, or other unintended instances of moisture. Second, utilize proper ventilation and air circulation in known moisture-prone areas. Being proactive in preventing costly damage or mold growth is the best way to feel confident that your home can handle the freezing elements and winter storms. Keep indoor humidity below 45%: According to the Environmental Protection Agency (EPA), the best way to control indoor mold growth is to carefully monitor and maintain your home's moisture level. If the humidity in your home rises, look for the sources of added moisture and address the problem as soon as possible. Place a dehumidifier in these rooms to lower the moisture level until a permanent solution is found. Increase Air Circulation: Ceiling fans, bathroom and kitchen exhaust fans, and attic fans are ideal for improving air circulation in many of the troublesome areas for added humidity, warmth and condensation; bathroom and kitchen exhaust fans can really help to remove moisture and promote air exchange while cooking and showering. It’s equally important to vent the attic space to prevent moisture and mold accumulation, and if you keep your dryer in the basement make sure it is properly vented to avoid moisture and mold concerns. On nice days when the air temperature isn’t too cold, consider opening a window or two for ventilation and fresh air exchange. Reduce Condensation Upgrade Your Windows and Insulation: Many homes and businesses don’t have proper insulation inside exterior walls or between the attic and living space, condensation can form on the inside of a cold, poorly insulated walls and windows, when in contact with warm, moist indoor air, creating an optimal area for mold growth. Insulating your plumbing can reduce sweat and keep them sage from water damage during the cold. Check for Potential Leaks and Repairs: Winter mold grows rapidly when there are leaks or water damage from winter weather disasters, such as burst plumbing pipes, or roof leaks following a freezing event. Water damage can be very dangerous to commercial or residential property, it can lead to the development of mold after as little as 24 hours and cause serious health issues and compromise the structural integrity of drywall, ceilings, floors, carpeting and other contents. The best way to minimize damage from a water emergency is to contact SERVPRO we have teams of professionals ready to restore and repair your home or business quickly and effectively. Mold can be a major problem for residential and commercial property owners, using the prevention tips outlined above can help keep your property mold-free. If you do discover mold in your home or business, the best thing to do is call our professional mold remediation team at SERVPRO of East Windsor. We use various containment procedures to prevent mold spore from spreading and we have specialized filtration equipment that allows our professionals to capture microscopic mold spores out of the air. The proper mold remediation solution for your home or business depends on the amount of mold growth and types of surfaces on which the fungus appears. Our mold remediation team at SERVPRO of East Windsor has the tools and equipment to inspect and assess the damage and determine the best methods to contain and remove the mold, clean and restore your contents and property and, help identify the cause of the water or moisture problem so that it doesn’t cause additional damage in the future. Frigid New Jersey winter weather and Blizzard conditions can cause BIG problems for New Jersey home and business owners. 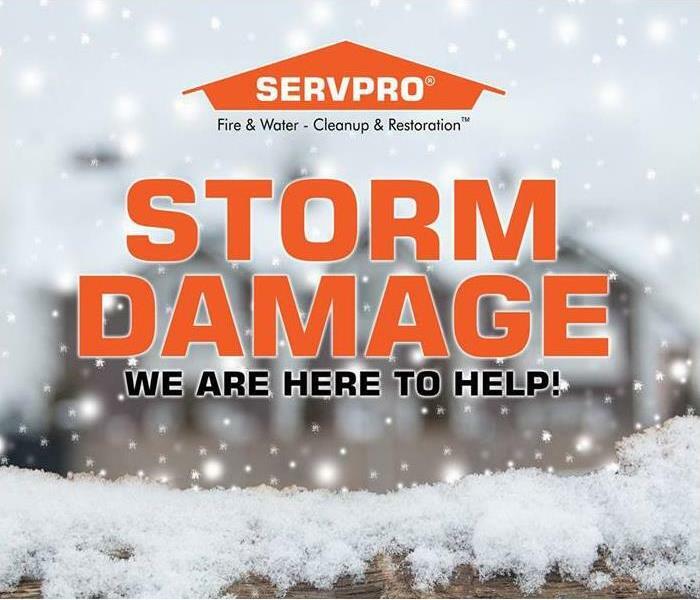 Frigid winter weather and Blizzard conditions can cause BIG problems for New Jersey home and business owners; restore your property damage with our SERVPRO of East Windsor cleanup and restoration team. As we settle in for what may or may not be an arctic cold and blizzard filled winter, it makes sense to review some basic steps to help shield your New Jersey home and family or your business and employees from the worst that Northeast Winters can offer. Cold temperatures, snow, ice, blizzard conditions with high winds and dangerous wind chills all contribute to the possible threat of a Monroe, Windsor, Princeton, or Trenton residential or commercial property disaster. Whether it’s a burst plumbing pipe or your water heater, an electrical fire or your furnace or fireplace has a puff back, winter poses a serious threat to your home or business from a fire, smoke, water or sewage property damage event. Did your New Jersey home or business experience a pipe break over the last several weeks during the arctic blast that hit the Northeast? When winter storms are coming to New Jersey it’s important to be prepared, our SERVPRO teams are ready and always prepared to handle any size property disaster. Calling SERVPRO of East Windsor after you experience water damage from ice dams or basement flooding from ice buildup or excessive snow melt, can be the difference from a quick cleanup and mitigation or costly restoration, construction and mold remediation services. Winter Weather Outlook: Meteorologists issue this typically 3-5 days prior to a winter storm when they believe wintery conditions are possible. Winter Weather Watch: Watches are typically issued 12-48 hours before a winter storm is set to hit. This is to advise the public of the possibility of a winter storm, blizzard, or other hazardous wintery conditions such as freezing rain. Blizzard Warning: Sustained wind or frequent gusts greater than or equal to 35 miles per hour accompanied by falling and/or blowing snow, frequently visibilities less than 1/4 of a mile for at least 3 hours. Winter Storm Warning: Heavy Snow (snow accumulation of 6 inches or more in 12 hours or 8 inches or more in 24 hours), Sleet (accumulation of ice pellets 1/2 of an inch and greater), Ice (accumulation of 1/4 of an inch or more) and/or heavy Snow and Blowing Snow (wind is below blizzard criteria). Northeast Winter Storms can bring any number of potential hazards to your Trenton, Princeton or Windsor, NJ commercial or residential property, including fallen tree limbs, hail, blizzard winds and heavy rain and snow. Your home or business is at risk from a collapsed roof, or frozen pipe burst, once a significant amount of water from flooding or moisture affects your home or business, problems from water damage can start to occur. It’s critical to take quick action and call our SERVPRO of East Windsor team to begin taking steps to stop the damage from becoming an even bigger disaster. Our professionals first assess the severity of the situation and determine the full extent of the storm, flooding or additional water damage. Restoring your home or business quickly, takes specialized equipment and highly skilled IICRC professionals. Our team closely inspects the damaged areas; measuring the moisture content, humidity and temperature to assess the full extent of the damage. They provide a step-by-step solution to restore and repair your property and contents to help minimize additional damages. 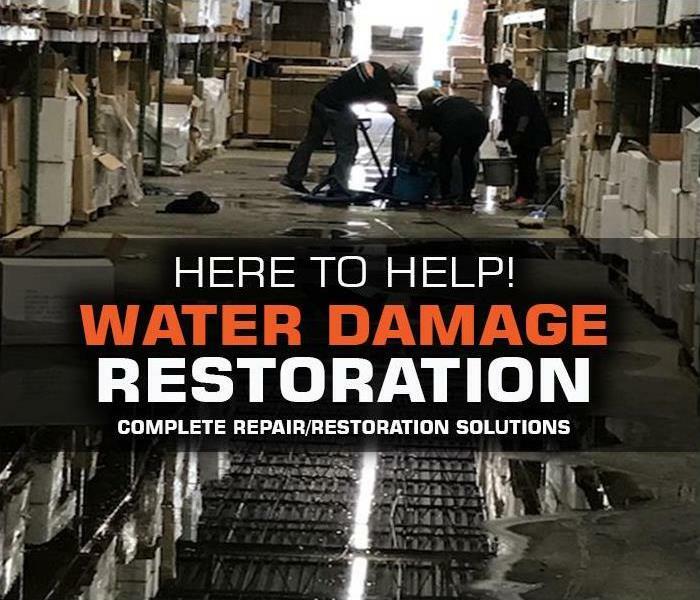 SERVPRO of East Windsor has helped countless local New Jersey business owners with emergency commercial water removal services following invasive, problematic water damage issues that have threatened to halt normal business operations. SERVPRO is a trusted leader in emergency property restoration and cleanup situations of any type or magnitude. Our water mitigation and restoration professionals care about your employees' health and business operations, they work efficiently and quickly to restore your property, “Like it never even happened.” We know how important your time is, our goal is to help you stay open, operational, and in business. If you find that your office, warehouse, restaurant or other commercial property in Princeton, Windsor or Trenton has experienced water or sewage damage, from broken plumbing, flooding, roof leaks or other types of water damage the most effective solution is to hire a restoration company like SERVPRO to begin the cleanup, repair, and restoration process. When your New Jersey home or business suffers a water damage, understanding what type of water you are dealing with is critical to ensuring proper cleanup. We offer 24-hour services, excellent customer service, and expedient remediation work that return your home to a safe, sanitary condition. Clean water originates from a sanitary source such as a broken pipe, or other water source; rainwater is also considered clean and poses no substantial risk from dermal, ingestion, or inhalation exposure. However, it may not always remain clean after it meets other surfaces or materials. Gray water is used to classify slightly contaminated water and has the potential to cause discomfort or sickness if contacted or consumed by humans. It may contain potentially unsafe levels of microorganisms or nutrients for microorganisms, as well as other organic or inorganic matter (chemical or biological). Black water is highly contaminated and filled with pathogenic, toxigenic or other harmful agents. Such water sources may carry silt, organic matter, pesticides, heavy metals, regulated materials, or toxic organic substances. Black water is typically caused by sewage damage, flooding or any type of natural disaster; Black water should always be handled by trained professionals. Class 1 is the least amount of water, absorption and evaporation. It affects only part of a room or area, or larger areas containing materials that have absorbed minimal moisture. Little or no wet carpet and/or cushion is present. Class 2 involves a large amount of water, absorption and evaporation. It affects at least an entire room of carpet and cushion (pad). Water has wicked up walls less than 24 inches. There is moisture remaining in structural materials and substructure soil. Class 3 involves the greatest amount of water, absorption and evaporation. Water may have come from overhead. Ceilings, walls, insulation, carpet, cushions and sub-floor in virtually all the entire area is saturated. Class 4 relates to specialty drying situations. Wet materials with very low permeance/porosity (eg. hardwood, plaster, brick, concrete, light-weight concrete and stone). Typically, there are deep pockets of saturation, which require very low specific humidity. These types of losses may require longer drying times and special methods. We have the knowledge, experience and proper equipment to locate any hidden moisture lurking out of sight and clean up water damage of any size and get it done right the first time. Moisture sensors, which are used to detect moisture in carpets, baseboards and walls. We have moisture meters that we use to test the actual moisture content of materials. The meters allow our technicians to accurately monitor the drying process. Our team also has thermohygrometers on hand to measure temperature and relative humidity, which ensures techs can calculate and create an environment that is most conducive to drying. When you have a commercial or residential water damage, don’t leave your property to chance. As a locally owned and operated business, Our SERVPRO of East Windsor teams are close by and ready to respond to your water and flood damage emergency. As leaders in the water damage industry, we have advanced training and expertise, not to mention a tremendous amount of hands-on experience. Getting your commercial property back in order doesn’t have to be a total loss. If you are experiencing a flooded commercial property in the Northern New Jersey area, make sure to consult a local SERVPRO professional clean-up and restoration crew as soon as possible to help ensure proper and thorough cleanup. Our team takes every step possible to minimize the intrusion while working on the cleanup and restoration of your winter storm property damage. Winter weather can cause damage from top to bottom in your Princeton, Windsor, or Trenton home or business. Our weather patterns have become increasingly unpredictable, resulting in heavy snow and freezing temperatures one day and warmer temperatures and rain the next. Ice, freezing rain, wind and snow all play a role in New Jersey winter property damage losses. The winter season creates the most common and costly claims for Princeton, Windsor, Trenton or Montgomery home and business owners, and winter-related claims are on the rise, likely due to the severity of storms and increase in the number of people with insurance protection. Over 50% of ALL homeowner claims come from wintery wind, hail, and weather-related water damage. ROOF DAMAGE: We often take for granted the work our roofs do for us during tough New Jersey winters, they keep us safe, dry and warm from the worst winter snow and ice storms. They bear the brunt of the elements, over time the cycle of snow and ice accumulation can have devastating effects and cause major damage to roofing materials and weaken the structural components. Excessive snow loads and weakened roofing materials from ice dams, pooling or leakage are all possible problems that can cause water to infiltrate your home or business and cause water damage. PIPE BURSTS: We also take for granted the plumbing system in our home or business we just know the water is running or in the case of a pipe freeze (not running). During the winter it gets cold and your pipes feel that too, if your pipes get too cold, the water inside will freeze. The ice can expand causing tiny stresses and breaks or a burst, when the ice melts water begins to leak and causes water property damage to your New Jersey home or business. Freezing pipes are a major concern, and a priority for our SERVPRO of East Windsor team; learn more about how we can help. Freezing pipes account for 18% of all water damage claims, damage from pipe bursts can include flooding, ceiling collapse, floor and wall damage, contents and electronic damage and mold. WET BASEMENTS: A Basement is a wonderful asset to your home or business, it can provide additional storage or living space to a crowded property. During winter months melting snow can cause water damage in your basement from faulty gutters, cracks in foundations and improper drainage. Water damage is one of the most common and worst side effects of water leakage or flooding in a basement. In addition to contributing to structural and foundation problems, basement water damage can destroy your personal belongings and interior decorative finishes and it also has the power to create the perfect environment for toxic mold growth. Our SERVPRO technicians are IICRC certified and have experience working with a variety of water damage situations both big and small. We have seen flooding and carpet issues, to broken or frozen pipe and plumbing issues, and basement and roof leaks. Our technicians understand that a property damage event can be traumatic and unexpected; they realize time and efficiency are important and they take every step possible to minimize the intrusion while executing the cleanup and restoration of your home or business. 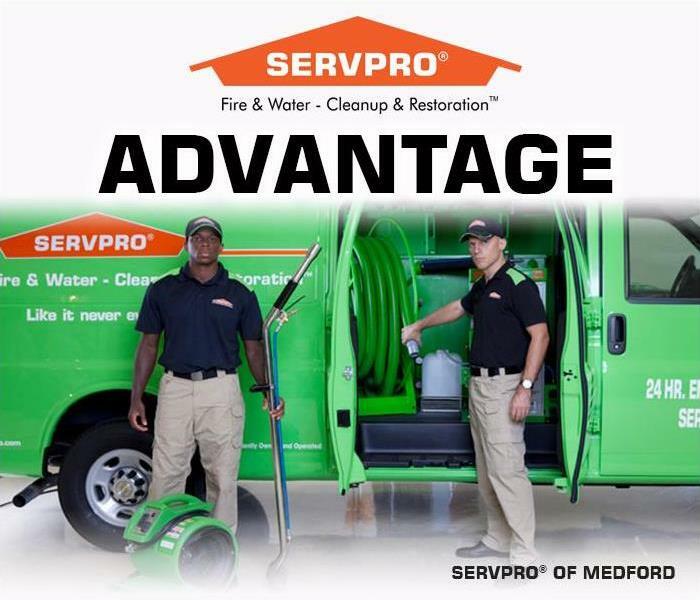 SERVPRO of East Windsor provides 24-hour emergency services to New Jersey communities, Princeton, Windsor and Trenton for fire, smoke, sewage and water and is dedicated to being faster to any-sized disaster. Our service pros respond immediately to your emergency and have the expertise to handle your restoration or cleaning needs. Acting fast after a fire, smoke or water property damage could be the difference between restoring your home quickly or needing extensive repairs. Property Emergencies happen every day, acting fast after your New Jersey property damage from fire, smoke or water could mean the difference between restoring your home quickly to preloss condition or needing extensive and expensive reconstruction. We put the best people, in the best locations, and give them the best resources to give your property the BEST results. You can recognize and trust the SERVPRO name... as a leader and innovator in the restoration industry, our team and equipment stand out above the rest. Since 1967, SERVPRO Franchise Professionals have been assisting client's fire and water damage cleanup and restoration needs across the United States, locally owned and operated, SERVPRO of East Windsor has been helping New Jersey residents and business owners with property losses in this community for nearly 30 years, we are able to respond quicker with the right resources, which is an extremely important component to the service advantage that the SERVPRO near you can provide. OUR Experience - Following a fire and smoke or water property damage to your home or business a courteous SERVPRO professional will lead the way. Our skilled technicians perform an inspection; checking for hazards and making a detailed list of professional services that can help restore your New Jersey home and contents. After explaining everything in detail, our technicians get to work restoring your home. You’ll see the SERVPRO advantage with a team on site, each performing different tasks designed to reach a specific goal. At the end of our restoration process, our technicians make sure you are satisfied with the work we have done, we have corrected any existing problems and remove our supplies and equipment making sure we have achieved the desired goal of restoring your home or business. OUR Training - SERVPRO of East Windsor’s team of highly trained employees never stop preparing. Each team member has been thoroughly trained for fire restoration, water restoration, carpet & upholstery cleaning, and mold mitigation before stepping foot inside your home or business. Our skilled SERVPRO technicians have ongoing training extending far beyond their initial IICRC training, with continued education programs and e-learning seminars and courses our technicians cultivate skills to make them more efficient with mitigation, remediation and ALL other advanced restoration techniques. We pride ourselves on providing industry-leading equipment and training to our teams to make your property damage cleanup and restoration process quick and effective. OUR Equipment - Our teams use high-quality products and advanced technology equipment to provide you with the most effective cleanup and restoration results. 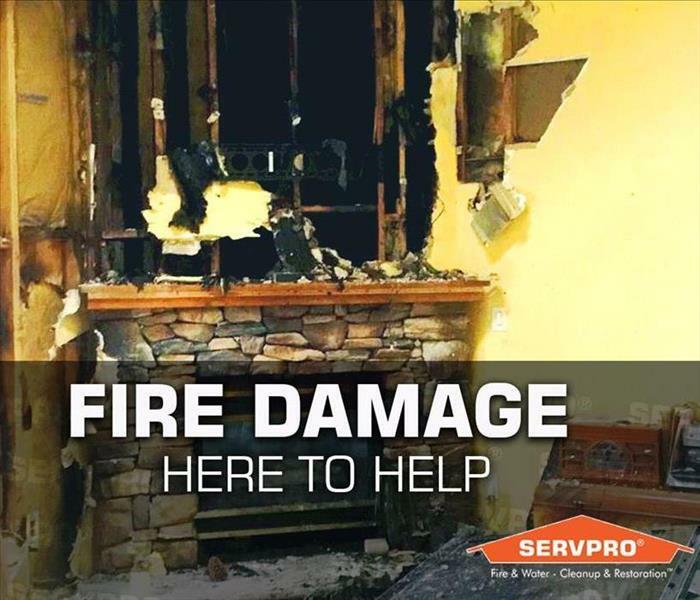 SERVPRO equipment makes a measurable difference in reducing the amount of damage sustained to your property and possessions following a fire, smoke or water loss. Our state-of-the-art equipment including, portable water extraction units, air scrubbers, high powered air movers, industrial-strength dehumidification equipment, and thermal imaging cameras all have crucial roles in the mitigation, cleanup and restoration process. Our technicians are specially trained to use these tools and equipment to diagnose what areas of your property sustained damage and give them a distinct advantage to determine the most effective and efficient way to cleanup and restore your property damage. 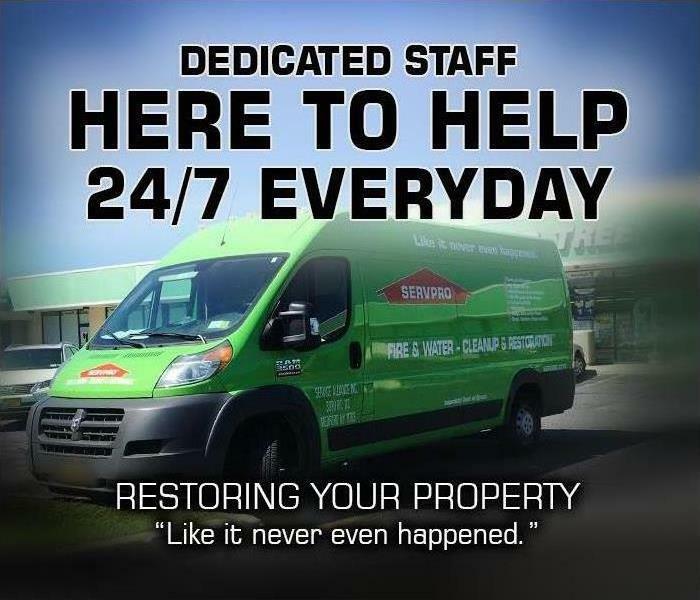 Are you looking for a reliable restoration company, SERVPRO of East Windsor can quickly and effectively reverse your property’s fire, smoke, water or mold damage, and restore your home or business, “Like it never even happened.” Give SERVPRO of East Windsor a call @ (609) 443-9110 we can promptly send one of our professionals to access your Windsor, Trenton, Montgomery, Princeton or other local New Jersey damage and get started on your repairs. See other ways that SERVPRO makes a difference on our Facebook page. Prevent a frozen water damage event in your home or business this winter. Freezing temperatures can be incredibly dangerous to your home or business, frozen water, snow and ice can cause significant property damage. 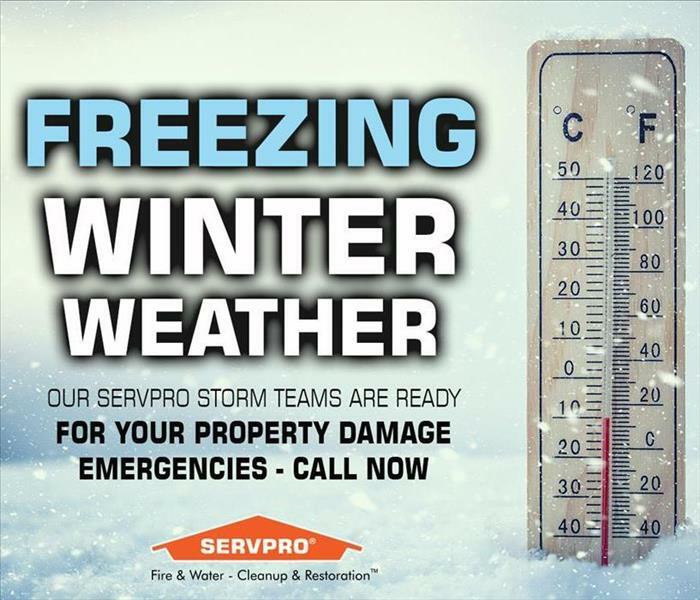 SERVPRO of East Windsor professionals specialize in the cleanup and restoration of your Windsor, Trenton, Montgomery or Princeton residential or commercial property after a frozen water property damage emergency. 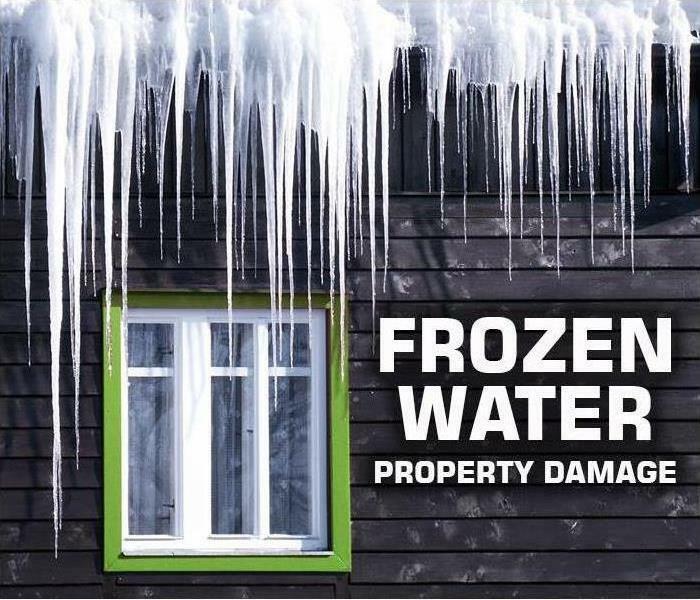 Winter weather and freezing temperatures can be incredibly dangerous to your home or business, frozen water, snow and ice can all lead to significant property damage disasters. On Average each year a quarter of a million homeowners will experience the destructive power of frozen water problems including, frozen pipe bursts, ice dams and other leaking water damage occurrences. A frozen pipe alone can result in gallons of water spilling over your floors, leaking or pouring through ceilings and walls, and ruining furniture and other valuable processions. Our SERVPRO of East Windsor staff is highly trained and experienced in the cleanup and restoration of your frozen water property damage from frigid Northeast temperatures. Our team can respond quickly and help you assess your damage and find a restoration solution that you can trust. Ice dams occur after a New Jersey snowfall and several days of freezing temperatures, common weather conditions in the Northeast during Winter. Warm air inside your home leaks into the attic and warms the underside of the roof causing snow and ice to melt. The melted water refreezes on the cold overhang and can form icicles and an ice dam on the roof and gutters. This process can cause damage to the roof which can cause water to leak into the home causing water damage to the ceiling, walls, insulation and other areas. Wet basements are a common occurrence for many homeowners in New Jersey, the impact of heavy snow, ice and rain on saturated soil often leads to water leaks, flooding and other types of basement and foundation water damage. Wet basements can lead to significant structural damage, destroy furnishings and other belongings and commonly lead to elevated mold and humidity issues. When Northeast temperatures drop to at or below freezing, the water flowing in your plumbing has the potential to freeze. Water expands when it freezes, the expansion of the frozen water can cause a rupture, causing catastrophic flood damage. It’s important to note that the break often occurs between the frozen point and the faucet, as the ice blocks the pipe and the water pressure increases leading to stress on the pipe. Pipes that run through the exterior walls are particularly at risk, but those that run through low- or uninsulated attics and crawlspaces can also freeze. Although, these frozen water damage situations are very common, sometimes the damage could have largely been prevented by taking a few preventative steps ahead of time. These are a few tips you can take to try and avoid turning the coming frigid days and nights into inconvenient and expensive property disasters. Exposed pipes are the most susceptible to freezing, insulate pipes in your home's crawl spaces and attic. Heat tape or thermostatically controlled heat cables can be used to wrap pipes and prevent ice dams. Seal air leaks in your attic, basement and exterior walls, look for air leaks around electrical wiring, vents, and pipes, and use caulk or insulation to keep the cold out. To avoid ice dams, add roof and soffit vents to regulate the air temperature close to the underside of the roof. Sump pumps and sub-floor drainage systems are typically used to avoid the continued damage associated with basements and other foundation issues. A trickle of hot and cold water might be all it takes to keep your pipes from freezing. Let warm water drip overnight, from a faucet on an outside wall. Our SERVPRO team never stops being READY to handle your fire, water or mold property disaster. Property Disasters don’t have regular hours and neither does SERVPRO of East Windsor New Jersey’s dedicated team of technicians and project managers. SERVPRO of East Windsor provides emergency cleaning and restoration services to Windsor, Monroe, Princeton or Trenton New Jersey 24 hours a day, 7 days a week—including all holidays. When property damage from fire, smoke, water strike, time is of the essence. Contacting a Disaster Restoration company within the first 24 hours after the initial damage can better prevent permanent destruction and reduce repair costs to homeowners. That’s why, SERVPRO of East Windsor provides 24-HOUR Emergency Support EVERYDAY! We always have a trained Disaster restoration professional here to help you with your fire or water property damage, call us (609) 443-9110. As a leader in property damage restoration and repair services, we have helped countless families and businesses through very unpredictable and devastating residential and commercial property losses. We understand you may not know what to do in a disaster situation, SERVPRO of East Windsor can help by responding faster with professionals who can help you through the restoration process. When you call, we will ask several questions regarding your property damage emergency. These questions will help us determine what equipment and resources to bring, including how many trained SERVPRO Professionals may be needed. Emergency Contact: After a property disaster or emergency at your New Jersey home or business, your call to us will connect you to one of our trained SERVPRO restoration professionals to take some basic information to provide to our project managers and technicians. Inspection and Damage Assessment including Estimate: One of our trained professionals will come and assess your property damage. What type of fire is it? What type of water loss was it? These answers are critical to addressing the unique solution for your restoration needs.?? Restoration, Cleanup and Repair: With your approval, our team of skilled technicians starts working on your restoration and cleanup. We can provide board-up, packing and itemizing your property, water, smoke or soot removal, drying and dehumidification, cleanup and repair services depending on your specific situation and restoration needs. Your best defense against long lasting commercial fire, smoke and water property damage is a quick and rigorous response by our trained technicians. Each SERVPRO of East Windsor team member has been thoroughly trained in fire restoration, water restoration, carpet & upholstery cleaning, and mold mitigation before stepping foot onto your home or business. Our restoration technicians utilize state-of-the-art equipment and technology to restore and repair your entire structure and belongings as efficiently as possible. 3/26/2019 - Spring is here, now is the best time to check for water property damage caused by Winter. 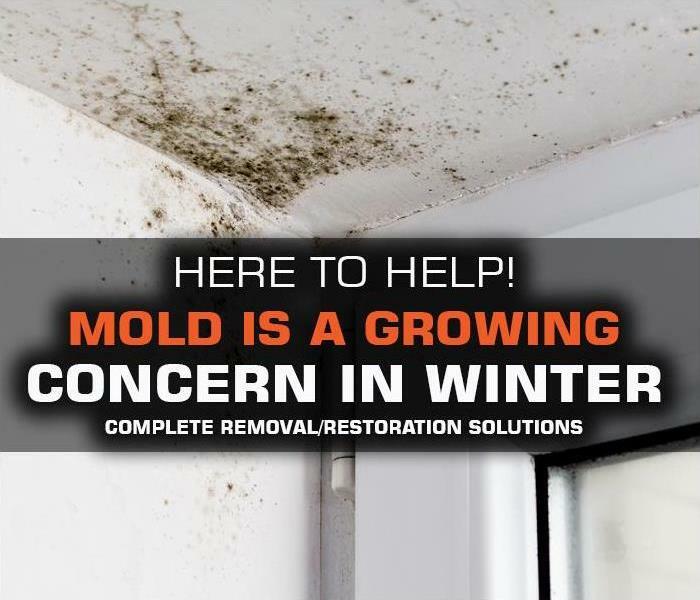 2/26/2019 - Mold is a GROWING ISSUE for Middlesex & Monmouth County home and business owners in New Jersey DURING WINTER. 1/7/2019 - Prevent a frozen water damage event in your home or business this winter.